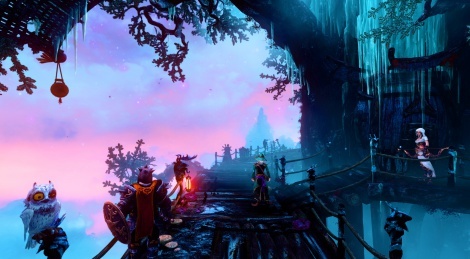 Trine 3: The Artifacts of Power is now released on Steam, GOG and Humble Store for $21.99 with a 10% launch discount. Mac and Linux versions should come later this year as well as news about console versions. Launch trailer and new screens inside. Really want this on my XB1 or PS4. Any idea when that's happening?!? Looks like a really cool step into a more diverse experience. Need to grab this one some time down the road. I like how they made it more "3D" in this one, as in various angles but still keeping it 2D. Game looks gorgeous as usual with fantastic art, if they put this one PS4 1080p/60fps i am getting it. Looks beautiful glad it still has some 2.5D elements, was worried it was going to go fully 3D which doesn't usually bode well with this type of game. PS. Whats going on with the sheep at 00.13. They're one version away from being Gauntlet third-person but play-by-yourself compatible. I like the first and second games, they're great. Hopefully this will be just as good. i play it since yesterday, it looks so amazing in REAL 3D. and the game is amazing too. Shroom vision simulator 3 nails it perfectly. Playing this on shrooms might be ill-advised though. This franchise is really cool w/ stereoscopic 3D too. That would be pretty cool on shrooms. I mean, if you were into that kind of thing. I really love the art in this series. While I own both the first and the second game I've never been able to push myself to complete them. OMG lol, that would be like Inception.